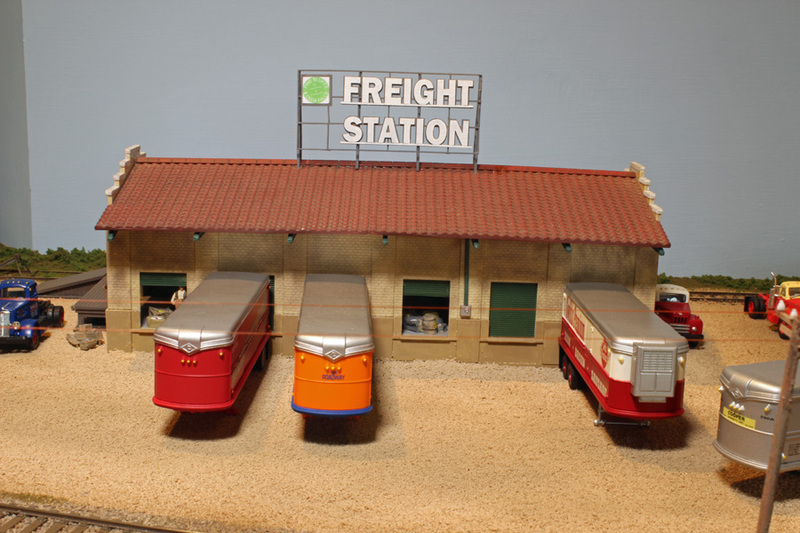 Pine Bluffs Freight Yard is one element of a modular layout from the American Section of Alton Model Railway Group. The Section created the fictitious Pine Bluffs and Ceda Falls Railroad in 2002 and has been exhibiting ‘Pine Bluffs Depot’ since 2006. The new Freight Yard layout continues on from the Depot (the road bridge being the division between the two elements). 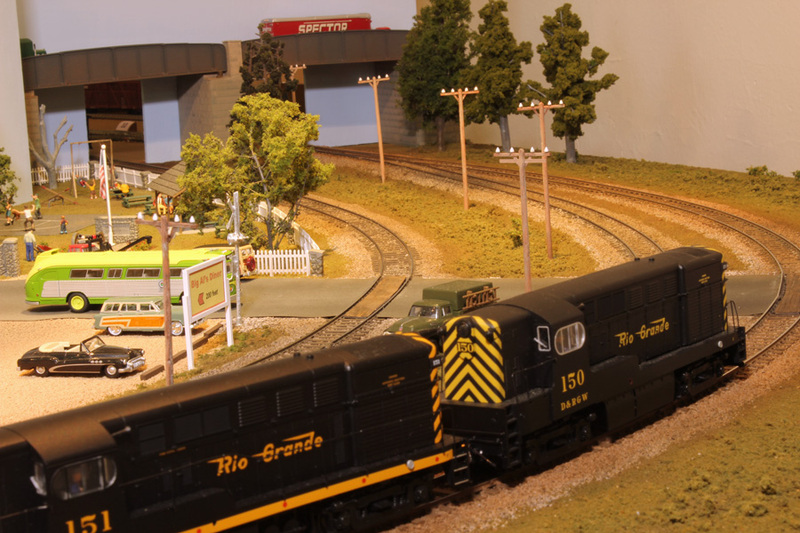 Modelled in HO scale (3.5mm to 1ft), the ‘Freight Yard ‘ layout is designed to combine continuous ‘train watching’, including ‘passing loop’ operations, with the variety of small freight yard switching. At the outset the Section developed a set of modular standards covering such aspects as baseboard dimensions, height, interconnection and track position at the edge of each layout element; this has enabled the overall layout to be developed over an extended period of time whilst still providing something to operate and exhibit. The baseboards are constructed using 6mm ply tops with fronts and backs using 6mm ply sandwich and the joining end faces being 12mm ply. Track and turnouts are Peco Finescale (code 75), turnout operation is a mixture of Peco point motors (on the mainline) and hand operation by rods in the yard. Control is by a Digitrax Superchief DCC system with point motors switched by accessory decoders. Locomotives are from a wide range of manufacturers including Bachmann, Athern and Walthers (Proto 2000/1000), many feature sound chips and speakers; rolling stock is mostly from the same manufacturers, all are fitted with Kadee couplings. 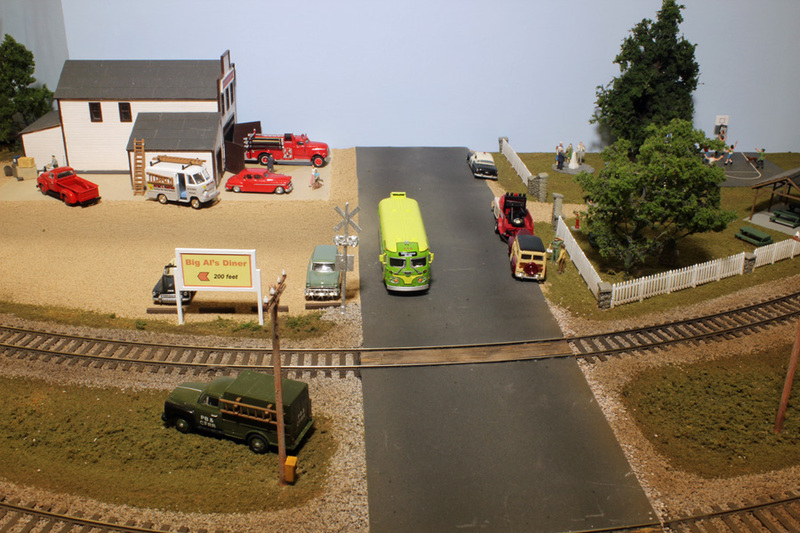 Scenic material is virtually all from the Woodlands Scenics range with detail parts and vehicles from the usual US sources. 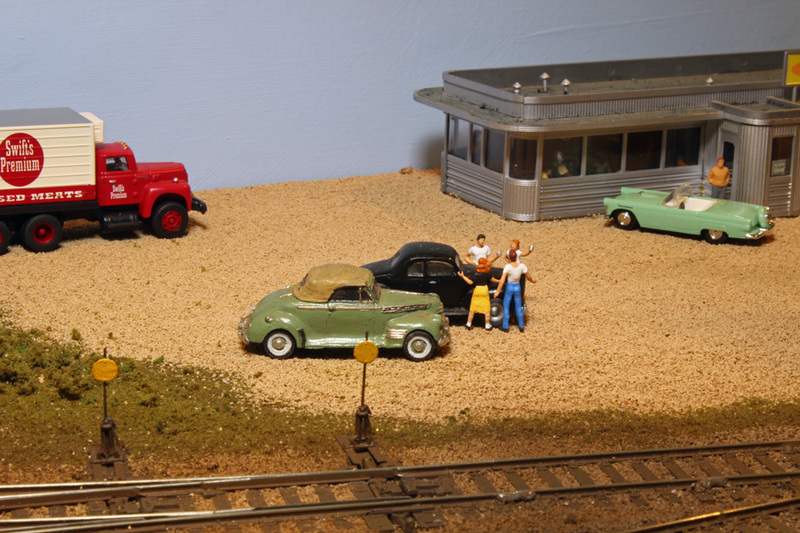 The yard buildings and the diner are Walthers kits whilst the firehouse is scratch-built. 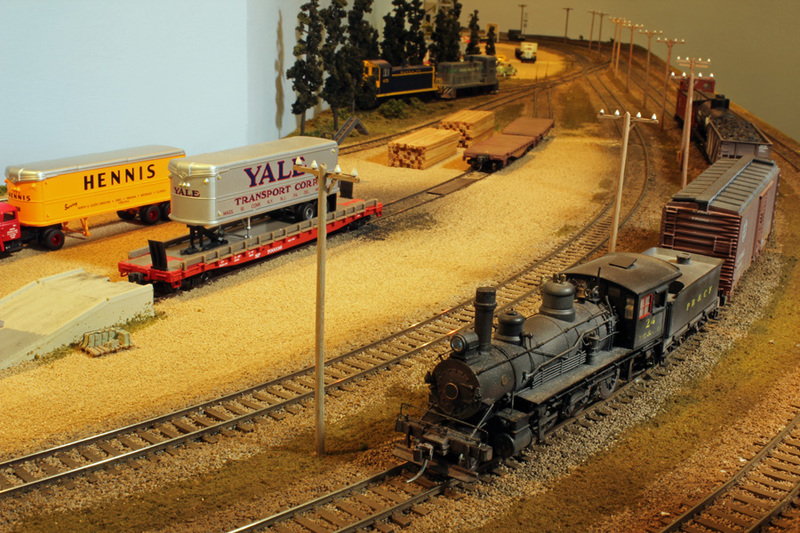 To book Pine Bluffs Freight Yard for your exhibition, please contact Allan Rose on 01420 564262.